(Bloomberg) -- The dining spots and events we’re most excited about in New York and Las Vegas. 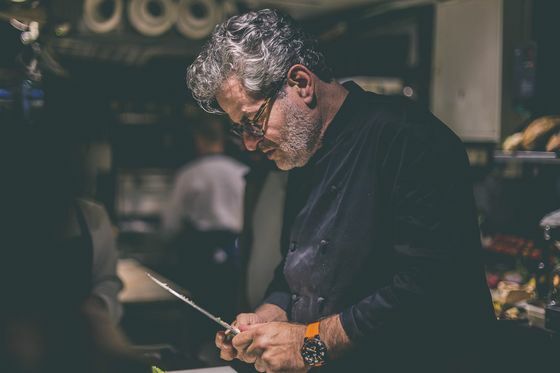 Eyal Shani is one of Israel’s top chefs and the judge of Master Chef Israel. But he’s best known for the raucous wedding-party-style dinners he hosts at his Tel Aviv restaurant HaSalon which happen two nights a week (with two seatings per night). The first is seating is traditional: A parade of ingredient-focused dishes served as classical music plays in the background. 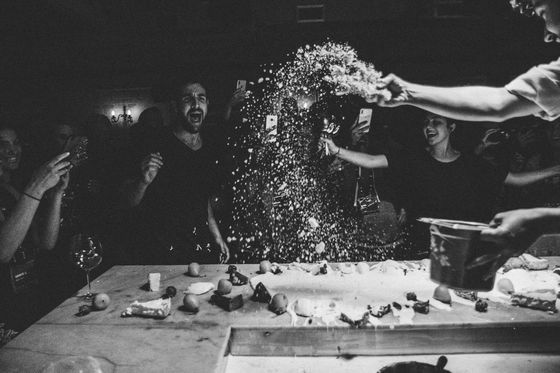 At the second seating, the music gets increasingly louder, a DJ appears, and the menu slides into the realm of performance art. “The first seating is dinner. The second seating is a party,” says Shani. Now he’s bringing the singular experience to New York’s Skyline Hotel, which will open three nights a week, Thursday through Saturday. A line of eight cooks working from an open kitchen will face the large, low-ceilinged dining room, with white and silvery gray bricks, and outfitted with variously sized tables seating around 120. The menu will change nightly, but a typical dinner will begin with squares of hot focaccia and spicy dip. 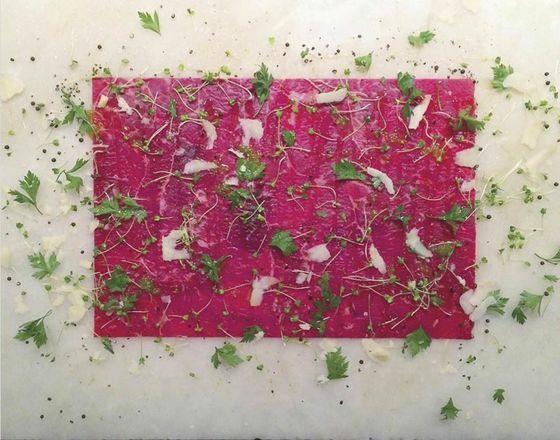 There will inevitably be beef carpaccio literally served on the table: A server wheels a butcher cart over, throws some sliced raw meat on the table, and uses a mallet to pound it thin. Shani has well-known affinity for tomatoes, choosing to serve them “naked” in his new restaurant: the fruit in varying stages of ripeness, chopped and drizzled with Sicilian olive oil and salt. He also offers pizzas, made with dough that ripples with big air pockets with toppings like an olive oil-heavy tomato sauce with mozzarella melted into it. He’ll also serve pastas that might range from squiggly shaped pici with calamari and burnt butter (or lamb ragu) to tomato ravioli with sage butter. The restaurant’s tabun—a special, pizza-like oven—will be utilized for roasting whole fish and large cuts of meat such as rib-eye and sirloin, which will be drizzled with butter and herbs before serving. The wine list will include about 60 bottles, mostly from Burgundy, plus some selections from the U.S., Israel, and Italy. A small selection of liquors, such as cucumber gin, will be on offer, along with a few food-friendly cocktails. But anyone who wants a Manhattan or Negroni will have to go next door, to the soon-to-open cocktail bar. Shani says to expect table dancing as the night goes on. “Sometimes it’s weird—mostly it’s fun—but everyone says they’ve never had an experience like it,” he says. Hours Thursday-Saturday, from 6 p.m.
For everyone who knows rosé season is year-round, the new dining room below the destination bar Saxon + Parole has arrived. The design group AvroKO (Beauty & Essex; SingleThread) created the space from S+P’s former wine cellar. It seats 36 guests at a mix of high tables and banquettes. 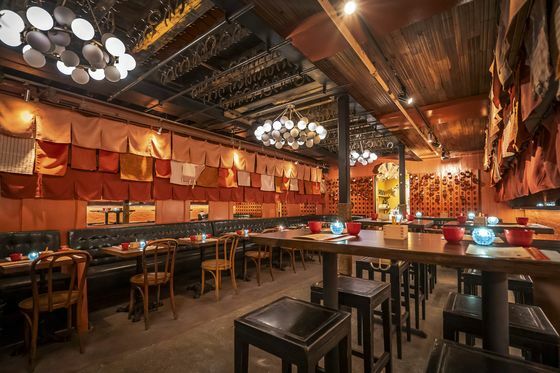 The walls are decorated with classic-style, Japanese-fabric room dividers made from coral fabric and velvet, plus flags made from deconstructed antique horse blankets. The adjoining “beverage room” is stocked with rosé , for customers who want to see and Instagram the wine they’re about to drink. Chefs Brad Farmerie and Nicole Gajadhar are featuring a seafood menu that highlights small plates. 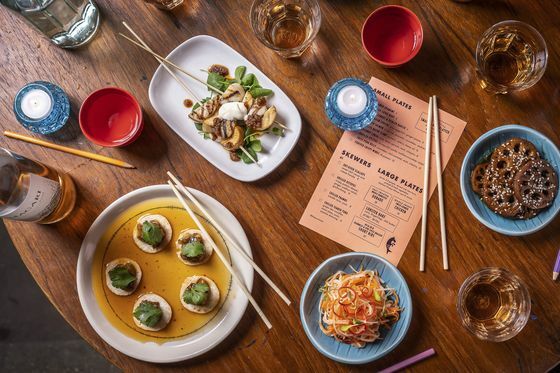 There are uni-topped English muffins, barbecued oysters with shrimp-chili paste, and lobster with pickled mango and lettuce leaves for wrapping. Skewers such as seared tuna, are accompanied by green-tea noodles, and prawns with Thai chile dipping sauce. Non-seafood fare includes Forever Crispy Wings with blue cheese aioli. To drink: a selection of 20 different rosés from around the world, by the bottle, pitcher, or on tap. The handful of cocktails includes the Poni 50/50 (gin, vermouth, cucumber bitters) and a rotating boozy slushie. The all-purpose list also has red and sparkling wines, soju, sake, and beer. Hours Tuesday-Thursday 6 p.m.-10 p.m.; Friday-Saturday 5 p.m.-11 p.m.
BigA is touting a “healthy” version of the beloved pizza. Chef Giovanni Barbieri, who honed his skills at the Università della Pizza in Padua, Italy, creates a crispy, light crust. The secret is “biga,” a 19th century fermentation process that makes the dough airy and moist inside. Toppings range from classic Margherita to the Gorda (hand-crushed tomato sauce, fior di latte cheese, spicy salami, gorgonzola, shaved leeks) and the Veneta (tomato sauce, fior di latte, spicy salami, Italian ham, mushrooms). 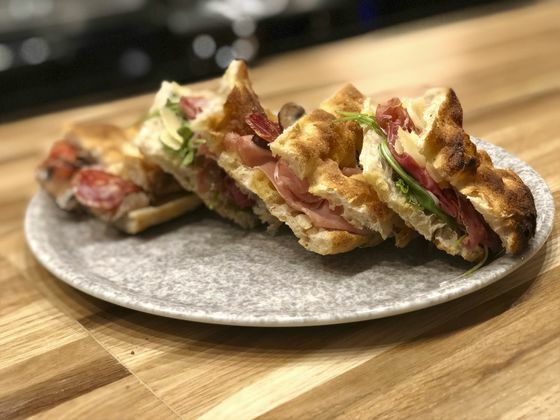 There’s a fast-casual-style selection of base crusts, including a multigrain round pie, a long, rectangular slab that can serve 20, and a panini-style bread. Barbieri offers a few non-pizza small plates, including assorted salumi, and salads, such as Sfiziosa with tuna and hard-boiled eggs. For now, it’s necessary to bring your own alcohol. The restaurant expects to receive a beer-and-wine license in the coming weeks. The place seats 48, including 10 at the bar. The corner space has big windows overlooking the street and an open kitchen with the vibe of an old school pizza joint. 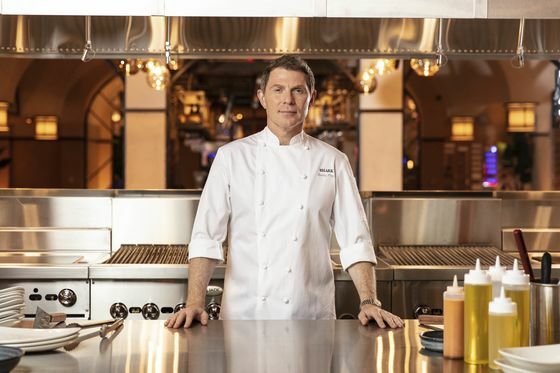 Shark, Las Vegas Bobby Flay is opening his first new concept in five years as part of the Palms Casino Resort’s $690 million renovation. The restaurant is named for Damian Hirst’s famous Shark which sits in the Palms’s lobby bar. “Latin flavors have been the backbone of my entire cooking career,” says Flay. His seafood-heavy menu features those flavors with such dishes as cured salmon and egg tostadas with rocoto hot sauce and black bean butter; a skewered taco cooked on a robata grill; and salmon sashimi with hot smoked chili dressing, made by a former Masa sushi chef who has joined the team. Opens April 5, Palms Casino Resort. 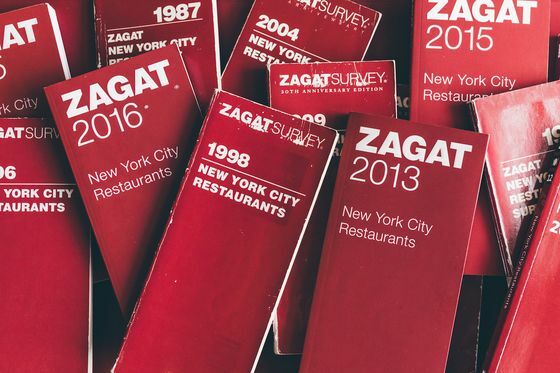 The Return of Zagat "From the moment we took control of the brand, we were interested in bringing Zagat back to print in some shape or form. We started hearing from Zagat's most loyal fans from day one. It feels good to have an answer for people,” says Chris Stang, co-founder and chief executive officer of online restaurant guide Infatuation, who bought Zagat in 2018. Zagat 2020 New York City Restaurants Guide will come out in November to coincide with the 40th anniversary of the guide. It’s the first print edition since 2016, and will be open to comments until May 5 at survey.zagat.com.